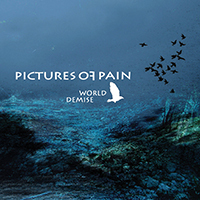 It’s been half a decade since PICTURES OF PAIN released their debut album, “The Reckoning”. They return with “World Demise”, an album that stitches together many genres. While the stitches show in places, each track has something to enjoy. “World Demise” is a mixture of melodic death metal, progressive metal and a touch of Black Metal. Sometimes the switches between these genres feels abrupt, as on “World Demise” (which is otherwise a glorious track). These sudden switches break the coherency of the tracks. Although it’s not unusual for metal bands to mix subgenres of metal, I don’t think that PICTURES OF PAIN have managed to blend subgenres as well as they could have. The switches between the Black Metal and Progressive Metal elements feel abrupt at times, as on “Out Of Control” and “World Demise”. Another significant flaw is that Hans Helge Iversen’s vocals are mixed too high. Although his clean vocals are an acquired taste, his Serj Tankian-like performance is mostly very well done. Despite my criticisms above, Frode Gundersen gives a great performance throughout on both lighter drumming and blast beat-heavy Black Metal drumming. When the Black Metal parts came in, I was reminded of a classic, second-wave sound, which was a positive aspect despite their not always fitting properly in the song overall. Additionally, he makes good use of the toms, which add body to his drum fills. “As We Fall” and “World Demise” end the album on a strong note, after enduring a sesquipedalian album. Nine songs within seventy-five minutes do feel a bit excessive. The band has a strong Progressive Metal influence, but unfortunately some of the musical tangents aren’t interesting enough, and so songs feel too long. However, there were a bunch of moments where Rune Fredriksen’s leads shone; “Time” and “Out Of Control” is two examples. I also enjoyed the slow, string-bend-filled solo on the final track. PICTURES OF PAIN has some good things going for them, and hopefully the good elements will come through more strongly on their next release. Here’s hoping that we won’t have to wait another five years to see how their sound evolves.